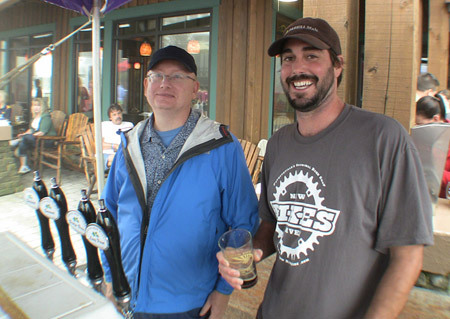 We welcome Ken Linch and Nathan Herrold to the show, founders of and brewers at Bridge Brew Works in Fayettville, WV. Topics include: opening and operating a production brewery in a state with extremely restrictive alcohol laws, capitalizing on visitors that come seeking whitewater rafting and other outdoor activities with fresh, local craft beer, and plans to expand without losing their hands-on approach. “They are trying to introduce new styles to an area otherwise devoid of craft beer, or understanding craft. The little town where we are, is an anomaly. There are several world-class restaurants here, and Bridge Brew is helping by providing them with fresh, local beers that range the spectrum. A simple cross-over lager? They have that… to very high gravity, and legit Belgian-style beers (Triple, Dubbel, Trubell). Posted in All Beers Considered, Interviews, The Maltercation.Tagged Beer podcasts, bridge brew works, Interviews, west virginia beer. Great interview. The guys were kind enough to send some beers to our fellow Alehead “Lord” Mashtun Copperpot. They were a cut above by really any standard. Our review seems to have been eaten by the gaping maw of optimized search, but it still exists at https://aleheads.com/2012/01/20/think-taste-with-bridge-brew-works/. Thanks for giving these guys some well-deserved recognition. No problem Pat… thanks for getting us in touch with them. Looking forward to trying some of their beer soon.